geldings, must be DNA tested. and a DNA "marker report" is produced. verification" is also performed by the lab. The Friesian Sporthorse Association uses the UC Davis Veterinary Genetics Laboratory for all of our DNA testing. UC Davis was the first to offer DNA testing of horses in the mid 1990's and was a pioneer in the use of DNA to verify the parentage of horses. Marker reports (and parentage verification whenever possible) are required before any Friesians or Friesian Sporthorses in the United States (except geldings) may be registered with the Friesian Sporthorse Association (FSA). In December of 2017 UC Davis began offering genetic testing for Friesians and Friesian-crosses for DWARFISM and HYDROCEPHALUS. We highly recommend testing any Friesians or Friesian-crosses which are being used for breeding to other Friesians or Friesian-crosses. "Results from the test assist owners and breeders to identify carriers and to make informed mate selection to avoid producing affected foals. Matings between carriers should be avoided as these crosses have a 25% chance of producing affected foals. Breeding carriers to normal horses is safe and a means to maintain genetic diversity in the breed and avoid production of affected foals." Horses which have only one copy of the dwarfism mutation or the hydrocephalus mutation are "carriers". Horses with two copies are "affected". Horses with no copies are "normal". Dwarfism primarily effects Friesians and miniature horses. Hydrocephalus primarily effects Friesians. This testing being offered is only for Friesians and Friesian-crosses. "Carriers" can still be used for Friesian and Friesian-cross breeding, but should not be bred to Friesians or Friesian-crosses which are also "carriers". Because these genetic mutations are almost entirely related to Friesians, a horse's status as a "carrier" would be virtually irrelevant when breeding to a horse with no Friesian heritage. The tests are $40 each, or $60 if done together. 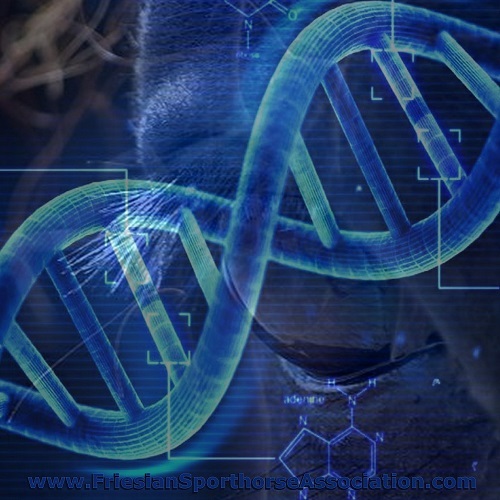 Any horses which currently have DNA on file with the FSA can be easily tested. Please contact us and we can invoice you via PayPal. Dwarfism and Hydrocephalus testing must be done thru the FSA or FHANA for the results to be considered legitimate. Dwarfism and Hydrocephalus test results from tests which were done privately will not be accepted. Can DNA determine a horse's breed? There are a couple of tests available which may offer some insight into the breed of a horse, but they are only offering probabilities and likelihoods. If you visit, for example, the Texas A & M website to read about their Horse Ancestry test, they openly admit "the test is reasonably good but there is no way to determine how accurate it is." Furthermore, these tests do not offer any information about parentage or pedigree, which is a mandatory part of registration as a Friesian Sporthorse. It is also crucial to know the pedigree of a horse in order to make informed breeding decisions, particularly in light of the inbreeding issues which have plagued the Friesian horse breed. Please do not be fooled by sellers claiming an unregistered horse is a Friesian Sporthorse or a Friesian cross and telling you "all you need to do is a DNA test to prove it." Friesian Sporthorse™ is a registered trademark of the Friesian Sporthorse Association LLC.